1. Potential to substantially expand access to high-quality health care. Geographic barriers will be overcome, community-based care will be easier to provide to the one in need, healthcare will be more convenient not only for patients but also for providers. 2. Capacity to substantially reduce health care costs. 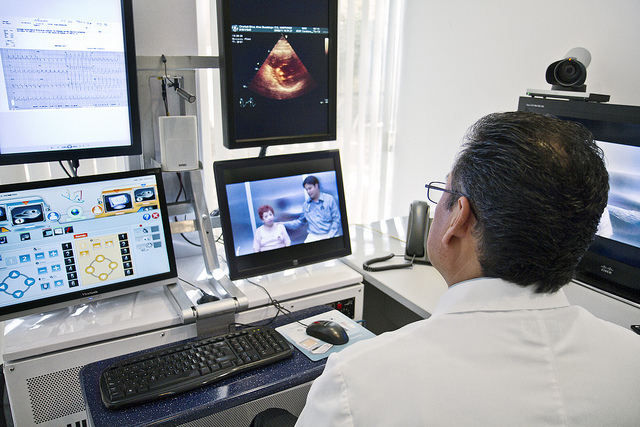 For every stakeholder, telemedicine has real cost-saving possibilities: for providers, it reduces the time and space needed (more patients can be seen); for patients, it dramatically lowers travel expenses and productivity losses; for payers, it leads to a double-impact with more productivity in one hand (and lower costs) and the ability to have better care for patients living in remote locations. 1. Concerns about effectiveness and cost-effectiveness. Theory is nice (see above) but what about reality? Telemedicine studies are methodologically weak… none of them include patient-reported outcomes. Solution? Do more research in order to prove the real benefits of telemedicine. 2. Technology issues and implementation questions. Solution? Study the context and provide a roadmap. 3. Lack of regulatory and legal frame (especially liability). Solution? Health care régulations revision. 4. No understanding of unintended consequences: financial (more encounters = more costs); interprofessional relationships (lack of continuum between a nurse and a doctor, a team; difficult collaborations as they are not long-term oriented); change in doctor-patient relationship and trust building. Solution? Integrate telemedicine in the current healthcare system; mix telemedicine with traditional face-to-face encounters with patients. Technology is key in improving efficiency but it has to be used widely and as a complement (and not substitution) to the traditional system. This entry was posted in Digital Health, Health Systems, Trend Box and tagged Digital Health, Health System, Innovation, patient-centric. Bookmark the permalink.